Manufacturer and exporter of Jute Webbing. 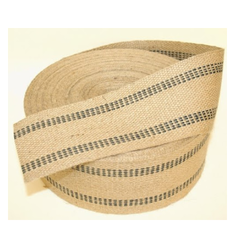 Our range of Jute Webbing is available with following features and specifications. Our company is reckoned to be one of the most well-known manufacturers and exporters of a wide array of Jute Webbings. These Webbings are fabricated in our state-of-the-art manufacturing unit. We make use of the best quality raw just and other materials, coupled with the latest technology. Further, these are widely used in various industrial sectors for different purposes. Hence, these are highly acclaimed by our huge client base for the quality and tensile features.